Smiles and high spirits inside of Marriott's ballroom for Sugar Land's Wine and Food Tasting. 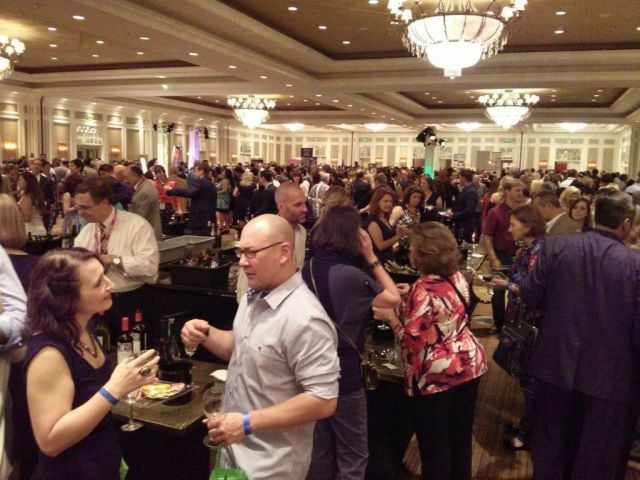 The 10thAnnual Sugar Land Wine & Food Affair last weekend was a big hit with food lovers. The list of participating chefs included such familiar names as Chef Rebecca Masson of Fluff Bake Bar, Chef Randy Evans of Haven, Chef John Sheely of Mockingbird Bistro, Chef Ronnie Killen of Killen Steakhouse, and Chef Junnajet “Jett” Hurapan of Blu Restaurant & Lounge. Hobnobbing with the culinary elite were several sommeliers, who were always ready to impart their wine knowledge and—the best part—keep our glasses full. For us the highlight of the five-day food fair was The Grand Tasting, held in the ballroom of the Sugar Land Marriott Town Square on Friday, April 26, and featuring delectable bite-sized samples, ranging from a pork shoulder seasoned with cumin and oregano to a filleted fish on a bed of fresh arugula. Apart from the food, we loved the creative displays--the one that we couldn’t keep our eyes (or hands) off was the H-E-B table of exotic cheeses, salami, and grapes, literally pouring out of wooden barrels. We're looking forward to next year's affair and more good eats and high spirits.